I’ve just finished yet another book about the 1920s. Surprise! This week’s read was Dope Girls by Marek Kohn. I’m cracking through books at an alarming pace with the new commute, even though it’s not much longer than the last. Ah, the joy of the ELL and its comfy, air conditioned carriages. 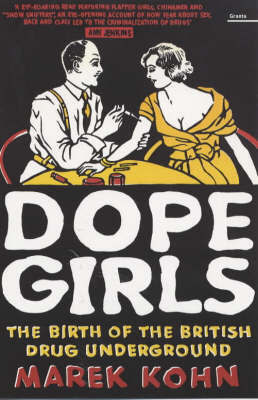 Dope Girls tells the (genuinely) fascinating story of drug use in London after the First World War, taking in high profile deaths, bona fide gangsters and the origin of pajama parties… It was a really interesting read, if not a bit gruesome at times. The casual racism is also a bit of a shock but the more 20s stuff I read the less surprising it becomes. Every time I pick up one of these books I assume there’s not much else for me to learn but obviously I don’t know half what I think I do because until this one I’d never heard of Broken Blossoms (yep, its original name is appalling). I was obviously familiar with Lillian Gash but who knew how important this film was? OK! Are we all back in the room and feeling alright? Silent movies are the creepiest of all, for certain. How about this other famous scene? Creeeeeeeeeepy. Wish I could dress as Lucy Burrows for Halloween and recreate that face all night, would be the most genuinely scary outfit in the world. I won’t tell you how the film ends but eh, don’t watch it alone. It’s all on YouTube if you feel up to it. There’s not much to this post other than to share the brain haunting that I’ve been through since watching it and also to recommend that book. And I do recommend it, it’s nowhere near as creepy as Broken Blossoms. The Gish sisters grew up near my college, and later in life, Lillian donated quite a bit of money to BGSU, and a theater was named for her. It’s a fantastic little place, with a small museum and photos from all (ahem, except Birth of a Nation) her films.